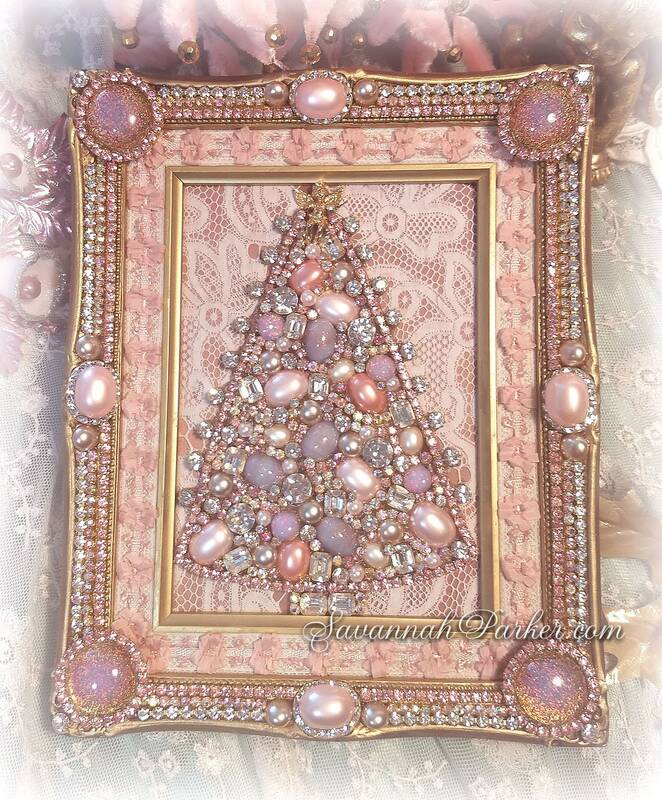 FABULOUS one of a kind jeweled luxurious blushing pink Christmas tree picture/photo frame loaded with jewels and pearls...my previous jeweled picture frames sold out completely so have been busy creating more beauties for you to enjoy....The centerpiece of this decadently gorgeous creation is a fantastic, glittering pink Christmas tree loaded with vintage jewels and pearls, set on a silk and antique lace background--- it will be an attention-grabbing showpiece wherever it is displayed, year-round! This listing is for the FRAME ONLY, stand/props not included. READY TO SHIP, for a fantastic gift! 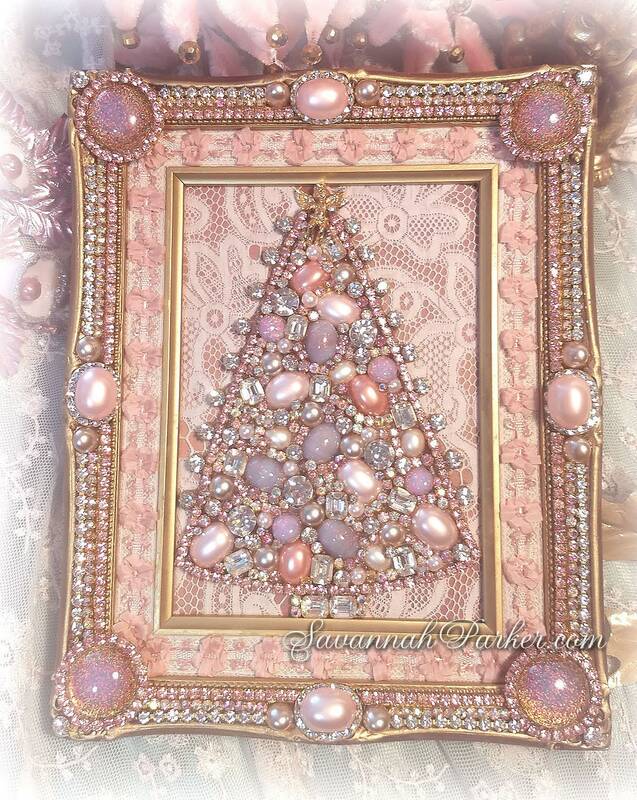 This truly exquisite and GLITTERING frame (so much sparkle, it's the first thing you notice when coming into the room) has a high quality gilded, painted vintage wooden frame base---no plastic or resin here.......To this I added exquisite multitudes of sparkling vintage blush pink oval pearls, big "diamond" rhinestones set in various-shaped brass settings, tons and tons of glittering small pink AB stones, and lots of smaller vintage "diamond" rhinestones in brass settings in multi-layers......then with four very large round vintage Czech glass blush pink fire opals circled in blush pink rhinestones, at each corner of the frame, three rows of pink, AB and "diamond" rhinestones bordering the entire frame and big pink oval pearls set in super-sparkly Swarovski "diamond" crystal settings and round vintage glass pearls grouped at the other four intervals. 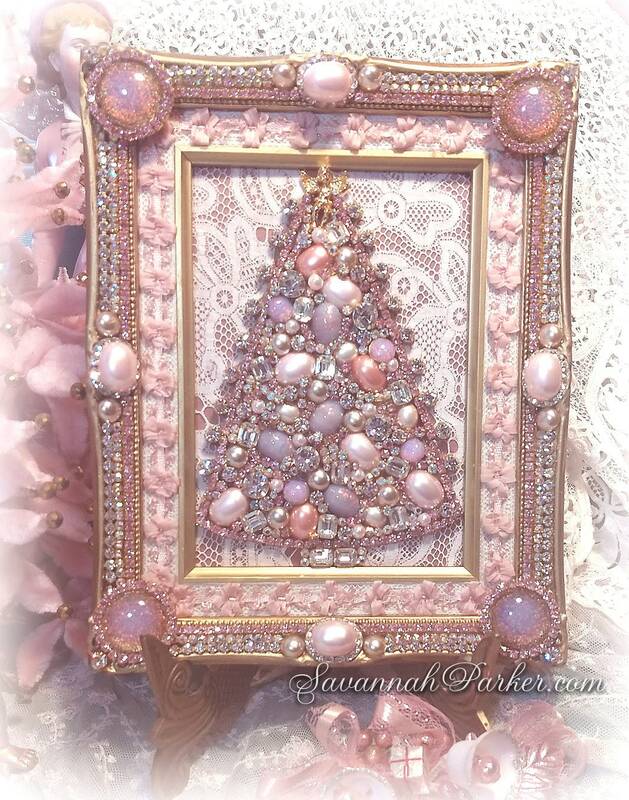 This piece has an inner frame which I've covered in fine antique lace topped by delicate vintage silk ribbonwork trim in light blush pink, echoing the colors in the tree....The magnificent Christmas tree is created from layers and layers of fabulous, glittering vintage clear rhinestones set in brass settings, pink rhinestones, vintage pearls in shades of deepest blush pink to cream; rare art glass pale pink opal-and-glittering-gold-flecked vintage Czech stones, tons of vintage pink glass fire opals.....there are simply LOADS of flashing, sparkling stones that make up the tree.......all topped by a darling little golden baby "guardian angel" at the very top of the tree. 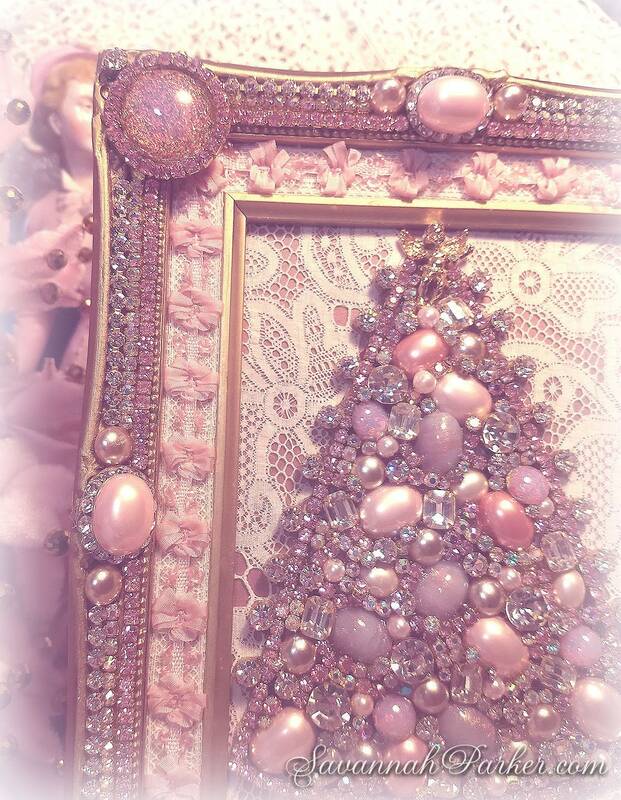 The finishing touch is the gorgeous antique lace-over-pink silk background that I've placed the tree on..... the effect is just fantastic and the bling endless (can't capture it in photos! )...truly fit for a Queen.......Very, very sturdy and durable, the stones are all securely and safely mounted and will not break off or come loose...this is a one of a kind treasure that will last a lifetime. 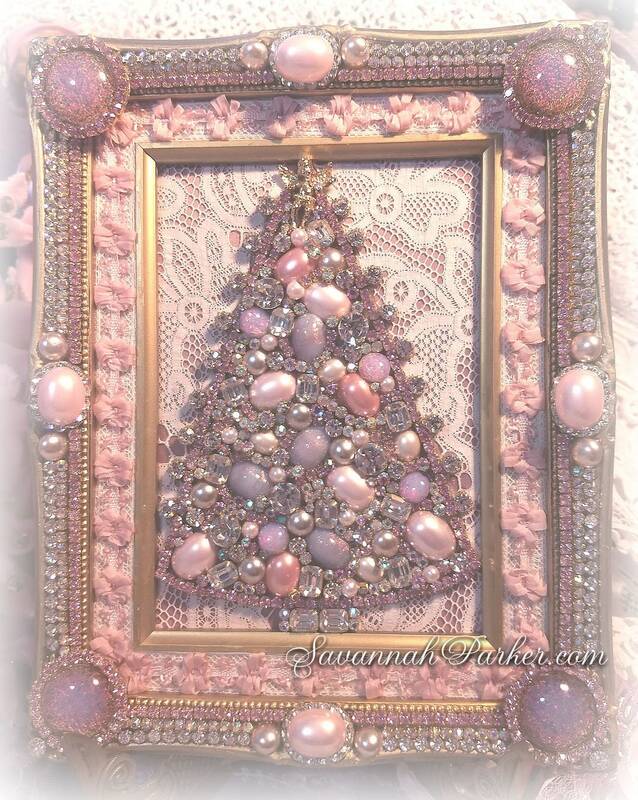 Perfect gift for Xmas or to use in a fabulous Pink Christmas decor theme. The stones & findings I use in my jewelry, frames and other pieces are wonderfully unique & vintage, and come from my ever-growing stock of fine antique and vintage beauties---am always searching for gorgeous old elements to recreate that fabulous antique look....this beauty is a great addition to any vintage/antique/bling lover's collection! 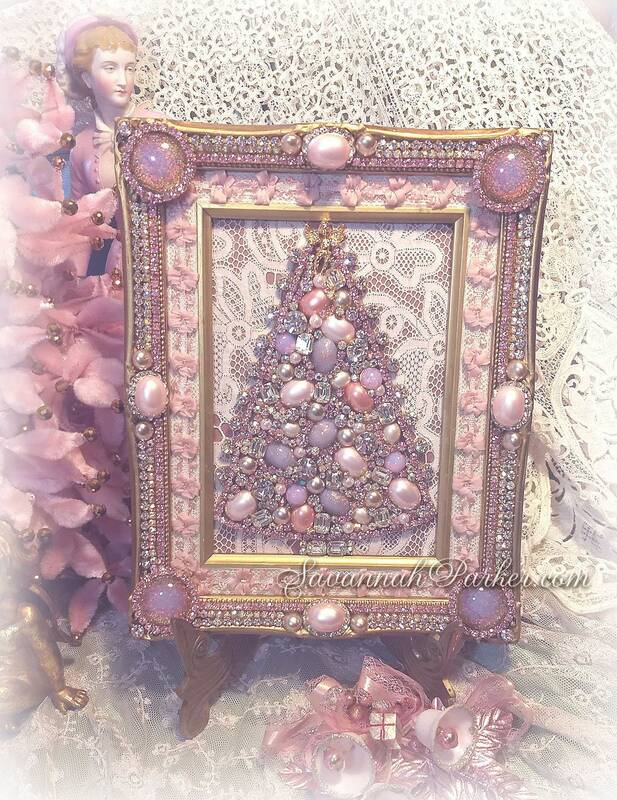 Size is 8" wide by 10" tall; easel stand shown is NOT included but this does work very well on whatever stand you choose, or you can add hanging hardware to the back to put it on a wall--I have left that up to the buyer and the back does not have any hooks or hangers on it. 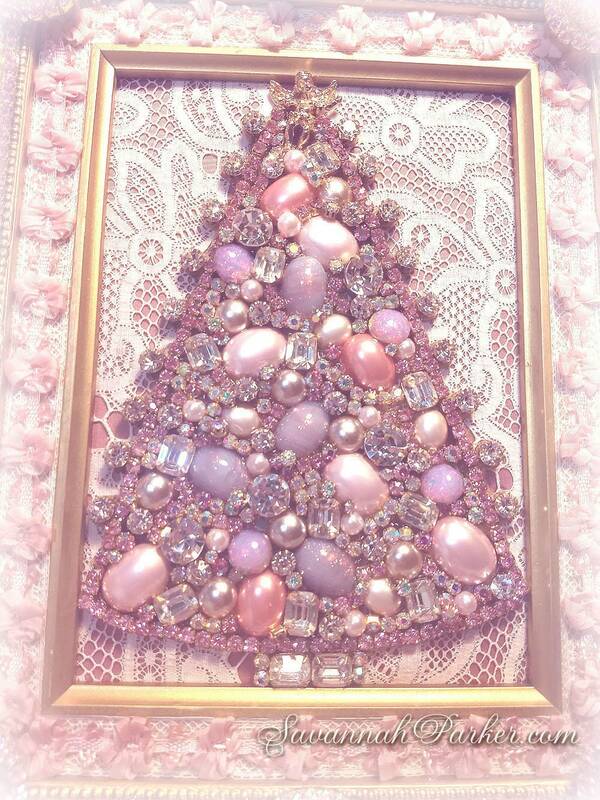 This would be absolutely gorgeous in a glamorous pink boudoir, even when it's not Christmas! NOTE: I will not ship by cheaper and less secure methods, nor will I falsify customs forms, so please don't ask. All sales are FINAL and I don't accept returns, so please be sure it's the item you want and read the description carefully, ask any questions you have before buying. If an item is damaged in shipment we'll be happy to repair it at no charge, however not after it's been worn/used! 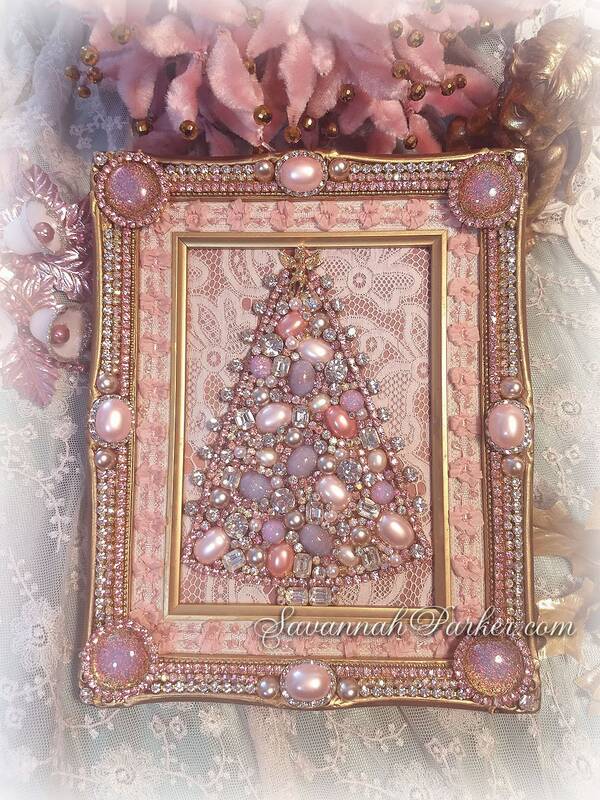 Do be sure to see my Facebook page for more pics of this beautiful frame...lots of closeup detail so do take a look. Please check my other listings for more of my original handmade, truly antique-in-essence jewelry, 1920s style hats, silk ribbon embroidered accessories and other great items....I will be adding many more exquisite pieces including more clothing, more hats, more jeweled frames, and more accessories so do come again soon and thanks for looking! Payment is due immediately upon purchasing item(s); I now accept Direct Checkout so buyers will have more payment options.....PLEASE NOTE: I do not take "offers", sell wholesale, or do ANY discounts other than on combined shipping; emails and messages asking for "deals", free shipping, free merchandise, free tutorials or price reductions will not be responded to---please do not ask! 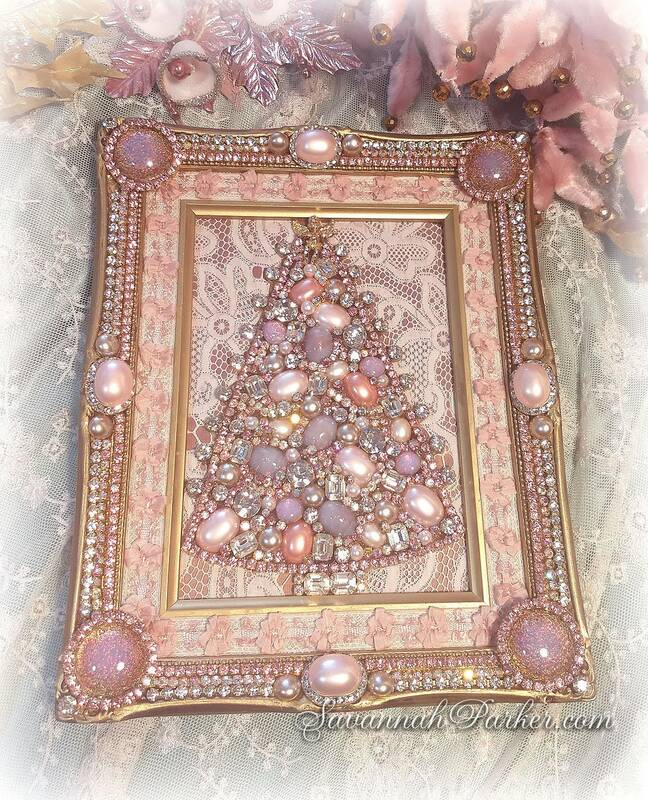 Important---PLEASE READ: I HAVE A FIVE TO SIX WEEK COMPLETION TIME prior to shipping many of my pieces (Some items are ready made and can be shipped immediately--these are noted as such in the listing descriptions), and I only ship once a week. I do my best to keep to the estimated shipping dates shown on orders/invoices, but please keep in mind those are only estimates, and there may be unforeseen slight delays in shipping time on occasion. ORDERS OF MORE THAN ONE ITEM WILL REQUIRE ADDITIONAL COMPLETION/SHIPPING TIME! Custom orders also may take longer than stated timeframes. SHIPPING IS NON-NEGOTIABLE. I ship everything the best, safest and quickest way possible to keep my creations safe and protected from damage, etc. I will NOT ship my items in cheap envelopes or any other methods than well-boxed USPS Mail, as that is the only method that affords trackability especially for overseas shipments---cheaper methods don't. All purchases are shipped USPS Mail with tracking, no exceptions. I am NOT responsible for customs charges, VAT charges, etc. or any other charges incurred once packages leave the United States; buyers pay ALL customs charges etc. once packages leave my hands. Please know what your customs, etc. fees will be BEFORE purchasing! PLEASE NOTE I DO NOT SELL TO ITALY, AFRICA, CHINA & several other areas. All sales are final and I don't accept returns, so please be sure it's the item you want and read the description carefully, and ask any questions you have before buying. If an item is damaged in shipment we'll be happy to repair it at no charge but ONLY if that is requested immediately upon your receipt of the damaged item, not weeks, months, or years later, or after you've worn or used it! I am not responsible for an item not fitting you properly, or color of item looking "different" as on your screen, or "looking too big" in person......as all items are very, very carefully described as to sizing, color, dimensions, etc. Clothing and hats in particular, are absolutely NOT returnable for any reason so please be very sure of what you require and take particular note of listed measurements and dimensions. I RESERVE THE RIGHT TO CANCEL A SALE or to refuse business if I feel there will be a potential problem. 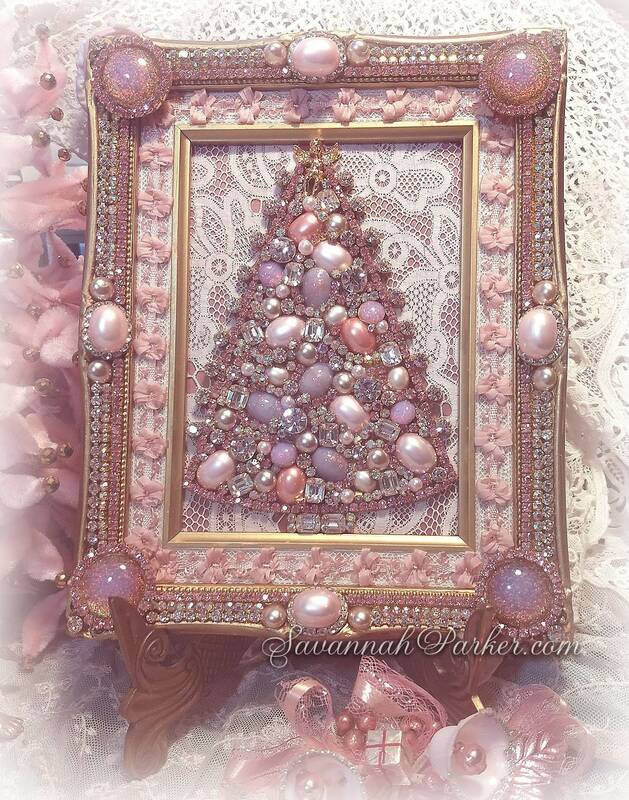 I do not share buyer's personal information with ANY source other than Etsy, for the sole purpose of fulfilling the buyer's order or communicating with the buyer; I do not use buyers' personal information for marketing, advertising etc.